Since 2008, this week-long program has brought talented young pianists from around the world to CIM for an immersive experience designed to cultivate and nurture the aspirations of serious young musicians. 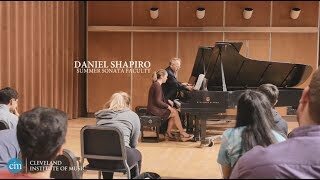 Directed by Dr. Sean Schulze and drawing on the distinguished faculty of CIM, Summer Sonata features multiple performance opportunities and regular individual lessons and group classes in theory, Eurhythmics, form and composition, improvisation, piano literature and more. Alumni of the program have been contestants and prizewinners at several regional and international competitions, including the MTNA National Performance Competition, Gina Bachauer Competition and Thomas & Evon Cooper Piano Competition. Our alumni have distinguished themselves as concerto soloists with orchestras throughout the U.S. and have appeared at major piano festivals in the U.S. and abroad. The Summer Sonata program has welcomed distinguished guest artists over the years, including Antonio Pompa-Baldi, Peter Takacs, Alvin Chow, Daniel Shapiro, Kathryn Brown, Emanuela Friscioni, Zsolt Bognar, Donna Lee, Angelin Chang, Sungeun Kim, Tianshu Wang and Jerry Wong. This year’s roster includes the Westhuizen Duo and Caroline Oltmanns, who are International Steinway Artists, CIM piano faculty members Daniel Shapiro and Kathryn Brown, and Longy School of Music piano faculty member Spencer Myer. Left to right: Westhuizen Duo, Caroline Oltmanns (photo by Dario Acosta), Daniel Shapiro, Kathryn Brown and Spencer Myer (photo by Supatcha Rattanathumawat). Talented young pianists aged 12-18 are welcome to apply for the 2019 Summer Sonata program, which will run from June 23-29, 2019. Musicians of exceptional ability who are not yet 12 years of age will be considered. Learn more about the program and its core faculty. Application deadline is March 22, 2019. Accepted students are expected to bring at least two performance-ready works to the program and are encouraged to bring more repertoire, as appropriate. All students are placed in a duet team. Music is mailed to accepted students in early May and is to be prepared in anticipation of the start date of the program. Instructional activities are scheduled between 9am-6pm each day. Housing is available for students traveling from out of town for an additional fee. Interested applicants are required to fill out an application and send an audition video by March 22, 2019. Learn more about the application, audition video and the program’s tuition and fees. All applicants are required to upload a YouTube link that will include two contrasting works for solo piano from two style periods. Audition repertoire should include works from the classical repertoire at a minimum difficulty level of Bach 2-part Inventions, early Beethoven Sonatas (Op.49) and above. Please email YouTube links to Mary Ann Grof-Neiman at mary_ann.grof-neiman@cim.edu.